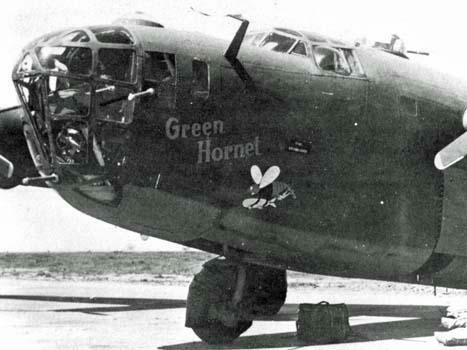 Green Hornet - a B-24D bearing serial number 41-24097—is the plane which Zamp and his crew mates were flying when they crashed into the Pacific on May 27, 1943. By May of 1943, Louie and his still-functioning crew mates returned to Kahuku. Instead of resting, they agreed to fly a search-and-rescue mission to Palmyra, where a crew had allegedly crashed. Minus their own plane, Super Man’s crew ended up with a “musher” - a bird which flies with its tail down and can’t get off the ground if there are bombs on board. No one trusted this musher - named the “Green Hornet” - so it was mostly used to fly the “cabbage run” (between Kahuku and the main island) and to provide cannibalized parts for other B-24s. (It is not to be confused, * however, with The Green Hornet - later known as the Ruptured Duck). On the 27th of May, Lt. Russell Allen Phillips (Phil) and his nine crew members boarded Green Hornet. They agreed to take another passenger - an officer who just wanted to visit Palmyra - and expected to be home for dinner (after refueling at the atoll). Phil was in the right seat because his co-pilot - C.H. Cupernell - had asked to swap spots that morning. Arriving at the cloud-covered search zone, Phil lowered his plane to 800 feet. No one saw any debris or evidence of a crash. Then ... the #1 (left outboard) engine suddenly dropped RPMs ... and ... died. Phil summoned the engineer - a new crew member recently arrived from the States - to “feather the prop” of the dead engine. Mistakenly, he stopped the #2 (left inboard) engine, leaving Green Hornet with no power at all on the left side. Get to your stations and prepare to crash. B-24s were hard to fly, but they were even worse to land on water. Inching closer to the ocean, with power only on the right side of his plane, Phil did the best he could to keep Green Hornet stable. It was no use. Veering left, the nose and left wing hit the water at the same time. The plane did a cartwheel, then blew up. Everyone on the left side died. Louie (at the right-waist gunner position) ended up underwater, reaching - he believes - a depth of seventy feet (before he surfaced). Phil, sitting on the right side of the plane, had a very bad (and bleeding) head gash. Francis McNamara - the tail gunner - positioned behind Louie at the time of the crash, was tossed-out at impact. Frightened, the new crewman was physically uninjured. B-24s, like all combat planes, are equipped with survival tools, including life rafts. Louie found two yellow rafts, giving the crash survivors a chance to make it. All three men were convinced a search-and-rescue party would quickly find them. After all, they were only 200 miles north of Palmyra - a short ninety-minute flight. When Green Hornet did not return to base, those in charge would dispatch a plane to find them. Two days later, in the middle of 65-million-square-miles of ocean, the survivors - Phil, Zamp and Mac - heard the sound of an approaching B-24. Flying low, the plane was so close Louie recognized it was from their squadron. No one on the search plane saw the raft. No Allied aircraft ever would (although the crew of a Japanese Zero did find - and strafe - them, puncturing the raft with about 46 bullet holes). Drifting for days - then weeks - the castaways had no food or water. They all knew about sharks which infested the area. An airman could survive a crash, only to be eaten alive by sharks. Soon reef and mako sharks found the men. They were even terrorized by a Great White. When an albatross landed on the raft, Louie wanted to end its life. Recalling the “Rime of the Ancient Mariner,” Zamp wondered if he, too, would be cursed for killing the bird. Figuring they’d all be dead if the bird lived, he did what he had to do. Rainwater provided a way to quench their thirst, but rain days were few. Then Mac - who’d never recovered from the Great White's visit - grew weaker and weaker. Wondering whether he would die, Mac requested Zamp’s opinion. Louie told him the truth, as he saw it. Caring for their raft mate, during his final hours, Phil and Louie ultimately committed MacNamara's body “to the deep” with a final prayer. Prayer wasn’t something which came naturally to Zamperini. Since he didn’t really know how to talk to God, he recited lines he’d heard in movies. When one is on a life raft, in the middle of the ocean - as Louie later said - one has little else to do but ... pray. * Thanks to George Kurz (whose father—Herbert T. Kurz, still alive and well at age 91—was the first pilot of The Green Hornet) for compiling the linked history of that B-24.